Friendship vs. Romance 57 - Pick your fav! Friendship vs. Romance 97 - Pick your fav! Friendship vs. Romance 33 - Pick your fav! Friendship vs. Romance 26 - Pick your fav! Friendship vs. Romance 15 - Pick your fav! What makes Deep luar angkasa Nine special compared to the other ST shows? What are your DS9 puncak, atas 10 episodes? "STAR TREK DEEP luar angkasa NINE" RETROSPECT: (5.04) "Nor the Battle to the Strong"
It has been a long time since I have watched an episode of "STAR TREK DEEP luar angkasa NINE". A long time. I have several DVD box sets for "STAR TREK VOYAGER" and the Syfi Channel now airs "STAR TREK selanjutnya GENERATION" episodes on a daily basis. So when I had decided to re-aquaint myself with the 1993-99 series, I chose the Season Five episode, (5.04) "Nor the Battle to the Strong". 1. Everytime anda get tea, no matter the flavor, anda say out loud, "Computer. Tea. Earl Grey. Hot." 2. anda become addicted to Earl Grey tea. 4. anda think paying $50 for a DS9 season is a good deal. 6. anda start buying boneka of your favorit charaters off E-bay. The documentary film, What We Left Behind: Looking Back at bintang Trek: Deep luar angkasa Nine, will take a detailed look at this historic series and consider the reasons DS9 went from a family outcast to a ST mainstay. Kira: "Why is it when anda smile, I want to leave the room?" a comment was made to the poll: Friendship vs. Romance 97 - Pick your fav! a poll telah ditambahkan: Friendship vs. Romance 98 - Pick your fav! a poll telah ditambahkan: Friendship vs. Romance 97 - Pick your fav! a poll telah ditambahkan: Friendship vs. Romance 96 - Pick your fav! a poll telah ditambahkan: Friendship vs. Romance 95 - Pick your fav! How well do anda know the Rules of Acquisition? 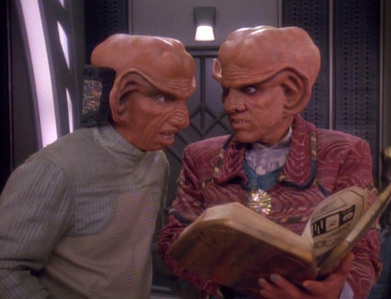 - "Nature decays, but latinum lasts forever"